The Eberhard EBIANUM doubles as a construction vehicle museum and a unique venue for all kinds of events. Memories, understanding, information, experience, discoveries, and a view of the future. Different is better than better. These feelings and thoughts guided us when we developed the Museum concept. Which adult doesn’t dream of being a child again for a while? This is where such dreams come true, for children in any case – the ideal environment for tuning into an event. Eberhard - Pioneers yesterday. today. tomorrow. 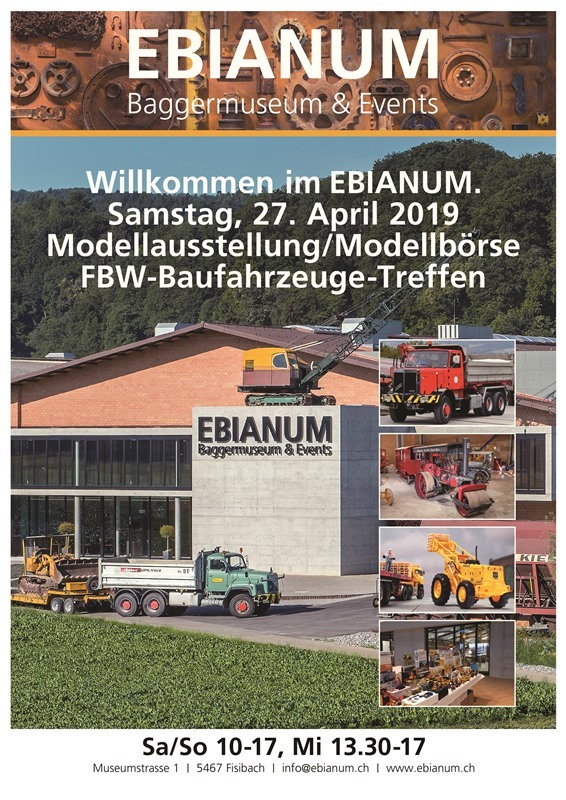 On Saturday April 27th 2019 the EBIANUM Digger Museum celebrates its fourth year anniversary with a huge scale model exhibition. Outside the museum there will be a F.B.W. Truck Meeting. So mark Saturday April 27th 2019 on your calendar! In addition, the doors from the EBIANUM Digger Museum are open to the public each Saturdays and Sundays and holidays from 10:00 to 17:00. On the free Wednesday afternoon EBIANUM is open from 13:30 to 17:00. The entrance to the "moving experience for young and old" in EBIANUM is not for free, but the unique collection of scale models in the museum alone is more than worth the entrance fee. Curious? Read the latest news on www.ebianum.ch or even better, come over for a visit at the EBIANUM. DOWNLOAD AND SHARE THE PDF POSTER! 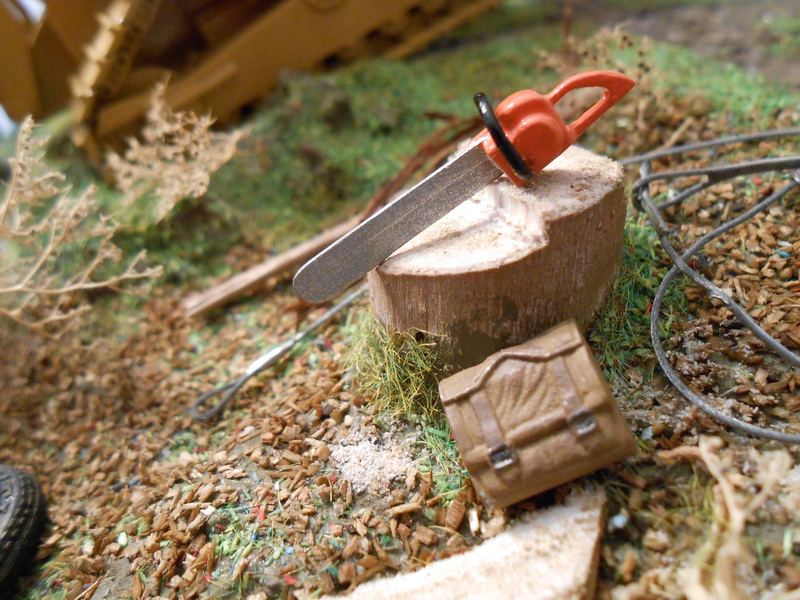 A few years ago the Chainsaw was released in a limited edition as a kit. Because of the interest of the collectors Ad Gevers has decided to make a second and finall run. 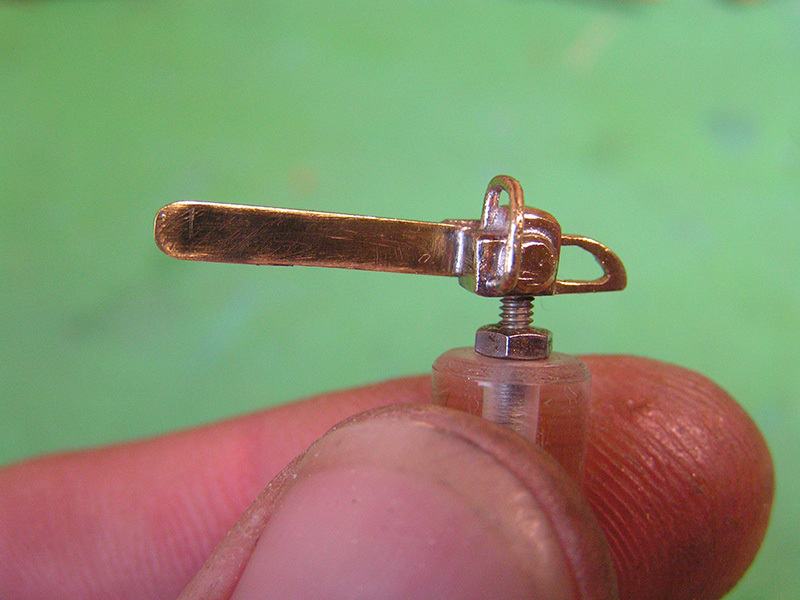 The chainsaw is made from one piece of cast brass. So this your last opertunity to buy this kit. Be quick to order your own kit because there are only a limited number of kits left and available. Diecast Masters is present with a complete new and larger booth at the International Toy Fair aka Spielwarenmesse held from wednesday, January 30 up to February 3, 2019, in Nuremberg, Germany. Diecast Masters shall during the Toy Fair reveal their line up with the new Masters Diecast scale models for 2019. 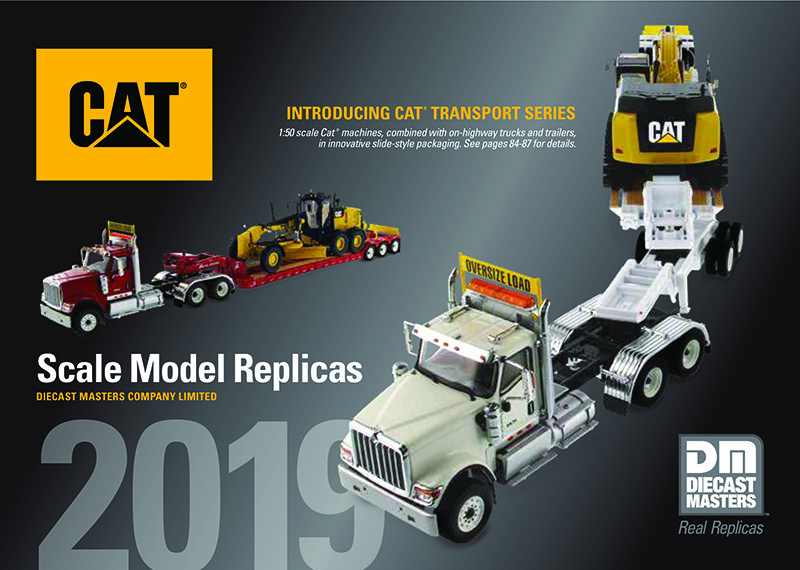 In addition to the previously announced road construction models the Caterpillar D6 Next Generation Track-Type tractor (in two versions) and of course all the other new (pre production) Caterpillar scale models from the diecast "High Line Series" will be shown for the first time to the collectors. 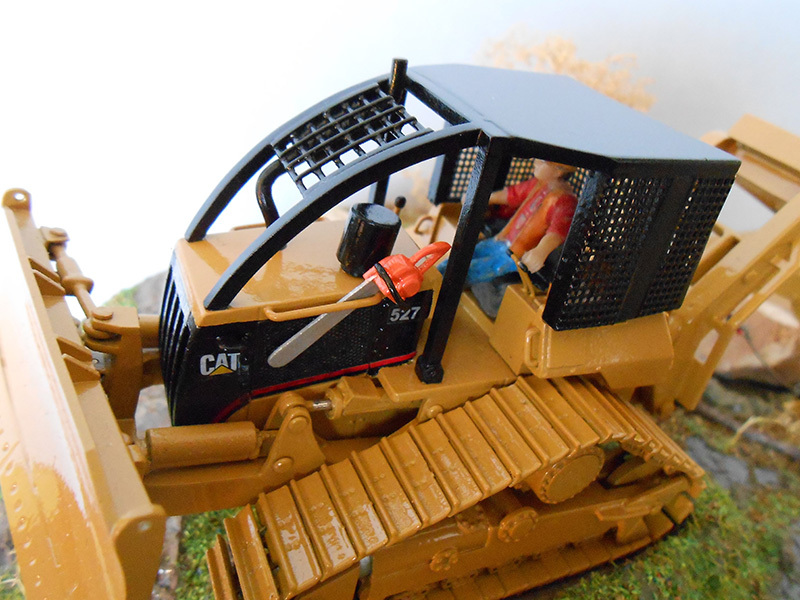 A HUGE surprise are both Caterpillar 336D (Diecast) and Caterpillar 320 "Next Genarator" Hydraulic Excavators which are Remote Controled in 1:16th scale. This is a great line-up! Keep on going Diecast Masters!!! 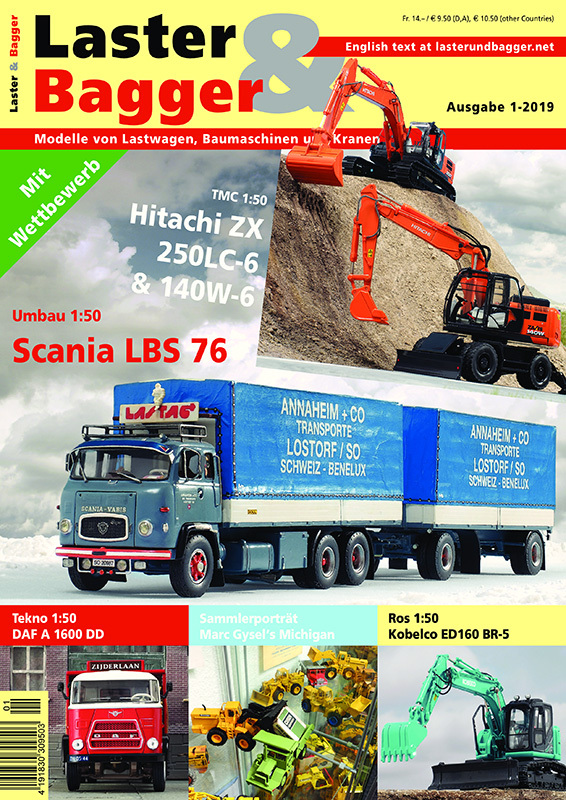 Diecast Masters has in advance of the worldwide release at the International Toy Fair aka Spielwarenmesse 2019 released their new 2019 Collection scale model catalogue. What to think about the Caterpillar 301.7CR 308CR, 309CR Next Generation series Mini Hydraulic Excavators, Caterpillar D6 Track-Type Tractor in two versions and the new launched Caterpillar CB2.7 Utility Compactor and the CB13 Tandem Vibratory Roller just to name a few! This is a great line-up! Keep on going Diecast Masters!!! 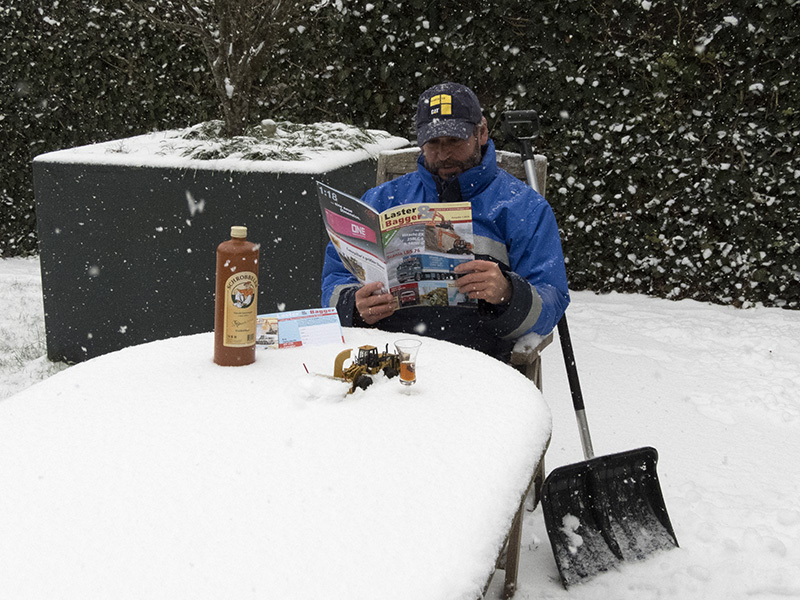 Unfortunally no snowplow! 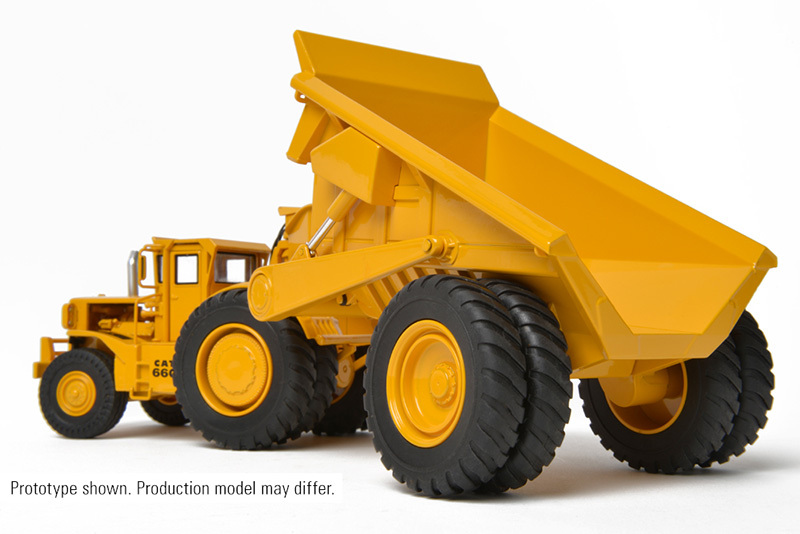 But in this latest issue, among other interesting articles, full attention for the Caterpillar No.12 en 12M3 Motor Graders which in early 2019 where released by Diecast Masters in 1:50th scale in their "Evolution Series". Last but least, Diorama construction which shows all the Tips and Tricks about making a rock face part. MUST READ! 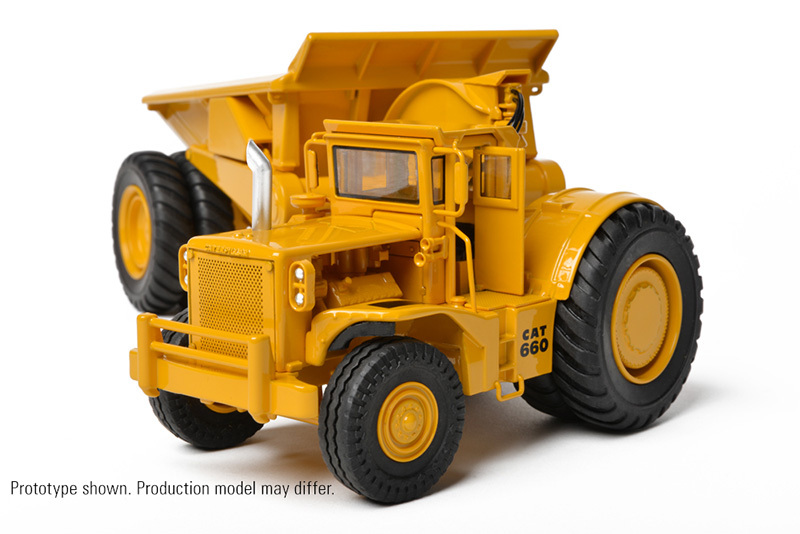 The Caterpillar Caterpillar 660 Tractor with Athey PR660 Rear Dump Trailer scale model is made in scale 1:48. As you expect from Classic Construction Models this HUGE and magnificent model has more then plenty of detail and functioning parts. Features and details on this model that demand attention include: Rear Dump Trailer, 3-Stage Hydraulic Cylinders, Fully Articulated Hitch, Opening Cab Door and Engine Visible Through Open Bay just to mention a few. Retail Price US $339,95 The Limited Edition Production run is 500 pieces. Final availability to be announced, but somewhere in 2019. So still time to save some money! Do you want to know more about this or other unique scale models from Classic Construction Models? Stay tuned to www.minimovers.nl for all upcoming, available and closed editions released by CCM. 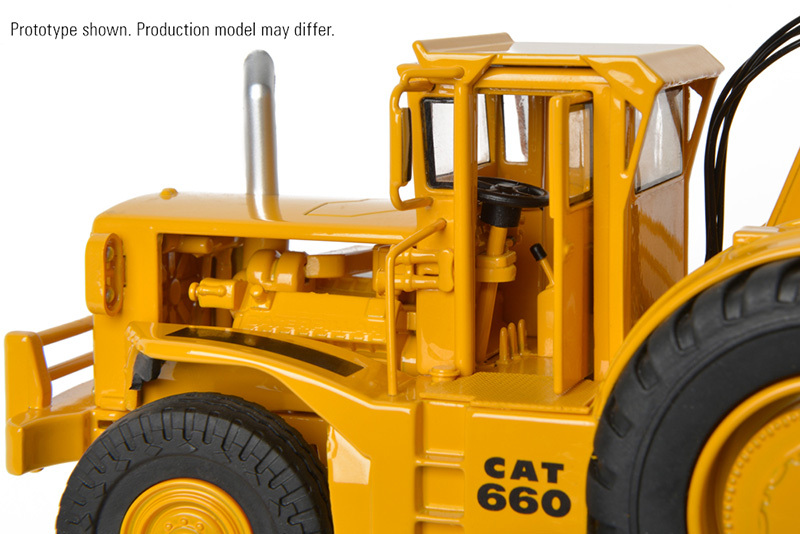 The Caterpillar 666 80-tons Wheel Tractor-Scraper scale model is made in scale 1:48. As you expect from Classic Construction Models this HUGE and magnificent model has more then plenty of detail and functioning parts. Features and details on this model that demand attention include: Tandem-Powered, Fully Articulated Hitch, Functional Apron & Ejector, Opening Cab Door and Functional Gooseneck just to mention a few. Retail Price US $359,95 The Limited Edition Production run is 500 pieces. Final availability to be announced, but somewhere in 2019. So still time to save some money! The first edition in 2019 of Laster & Bagger is on its way! At the moment the Magazine is already rolling off the printing press and it can fall on your doormat at any time. 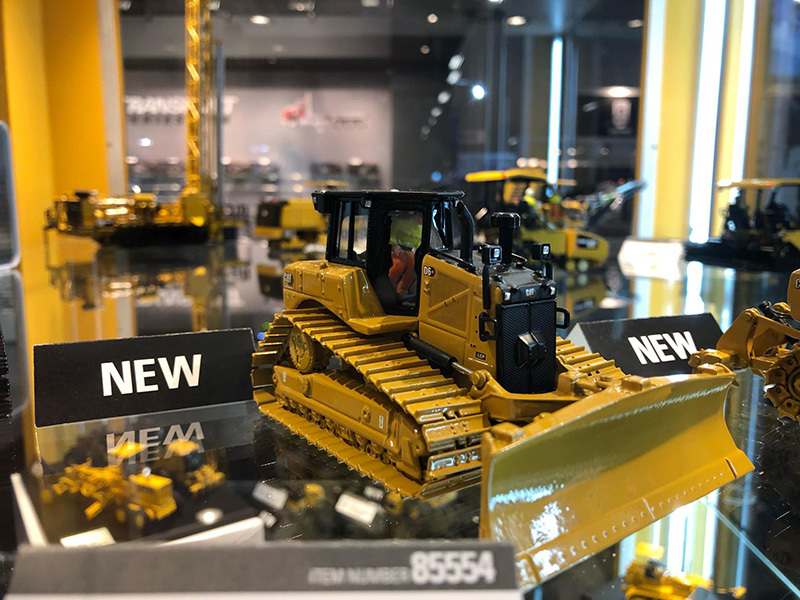 In this issue, among other interesting articles, full attention for the Caterpillar No.12 en 12M3 Motor Graders which in early 2019 where released by Diecast Masters in 1:50th scale in their "Evolution Series". The completely newly developed Caterpillar CS11 GC Vibratory Soil Compactor is a machine that is not yet included in the Caterpillar delivery program. All the more surprising that Diecast Masters has already announced this scale model in 1:50th scale. From reliable sources I learned that the introduction of this machine will only take place during the Bauma 2019. And then there comes a “baby” brother in the current CS34 up to and including the CS78B Vibratory Soil Compactor series. 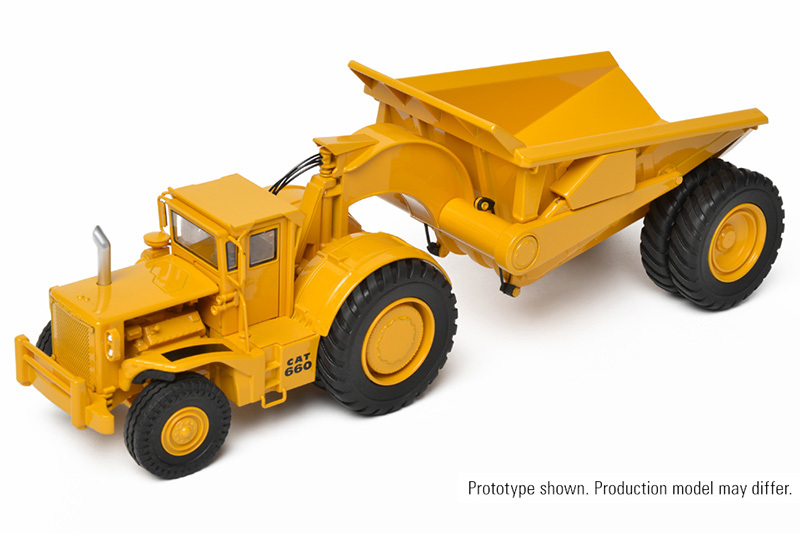 The Caterpillar CS11 GC Vibratory Soil Compactor in 1:1th scale is equipped with a Caterpillar C4.4 ACERT engine delivering 105.3hp Net Power. The machine has a operating Weight of 23,817 lb. and a has a Maximum Centrifugal Force of 56,200 lb. Key Features of the Caterpillar CS11 GC Vibratory Soil Compactor are a detailed cab interior, including "Bob" the operator. Authentic Cat Machine Yellow paint and trade dress. Finishing touch are the rotating drum and tires with authentic tread detail and its articulated steering. Presented in the “High Line Series Packaging” Collectible, full-color printed metal box, including machine photos and specifications. All in all, just like the 1:1 machine, a tough scale model without fuss!